Is your face looking older than you think it should? Why does your skin look so dull and lifeless? These questions can be answered by looking at the top ten lifestyle factors that can cause ageing skin. What are the top ten lifestyle factors that can cause ageing skin? Whilst it is lovely to get out into the sun, unprotected exposure to ultraviolet rays can have a severely negative effect on your skin. Not only is the risk of skin cancer increased the longer you expose yourself, but your skin becomes dry, more prone to wrinkles and dark spots, and loses its elasticity. 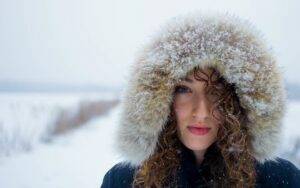 In cold weather, the blood vessels under the skin contract to prevent heat loss. Long periods of exposure to cold temperatures results in reduced secretions from the sebaceous glands, and the skin dries out. Dry facial skin can make you look older and usually occurs on the cheeks, jowls and around the eyes. You may also suffer from dry, chapped lips. Smoking has long been touted as prematurely ageing your skin. Nicotine narrows the blood vessels in the skin and decreases the blood flow, and the supply of oxygen and nutrients. Elastin and collagen, the fibres that give skin its strength and elasticity, may become damaged, making the face look older and saggy. The first effect that alcohol has is that it dehydrates your skin causing wrinkles. The second effect is inflammation. Alcohol inflames the tissues causing a flushed appearance and if you continue drinking, over a period of time, this facial redness may become permanent. There is a good reason for the term ‘beauty sleep’. Whilst we sleep, the body takes the time to regenerate and recharge itself. Sleep deprived people tend to suffer from a reduced rate of growth and renewal of skin cells, resulting in dull looking skin. A healthy diet is important when it comes to maintaining healthy skin. The saying ‘You get out what you put in’ certainly applies. If your diet lacks the necessary nutrients, it will lead to a build up of deficiencies which will ultimately impact your skin in a negative way. If someone tells you that you look stressed, they do not necessarily mean that you look worried. Stress can cause dry, flaky skin, bags under your eyes and fine lines. Nearly everyone uses cosmetics of some description, however many of these products contain chemicals that penetrate your skin and can adversely affect your skin health. Oestrogen is responsible for helping to keep the skin soft and hydrated. Low oestrogen levels will result in dry, tired looking skin. A lack of oestrogen can also cause insomnia, another cause of poor skin condition. Wherever you are, you will come into contact with toxins. These toxins can suppress the immune system and prevent the body from repairing itself. To combat this, make sure that you eat a diet rich in antioxidants and wash your skin regularly. Being aware of these lifestyle factors that can cause ageing skin will help you protect your skin and retain a healthy, youthful look longer.